Liverpool’s kit will feature a different logo across the front against Manchester United on Monday, and it’s for a brilliant cause. As a cub, we’re supporting the blindness charity ‘Seeing is Believing’ and will don their logo instead of our regular sponsor Standard Chartered’s. 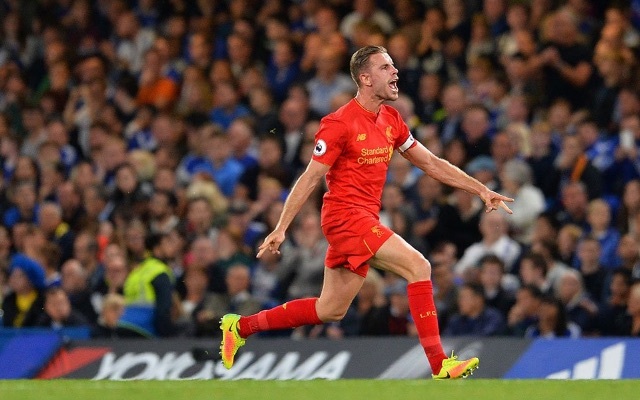 You can see the one-off strip below, as modelled by skipper Jordan Henderson. #LFC & @StanChart have teamed up to tackle avoidable blindness. Hopefully we’ll have to see Jurgen Klopp’s team’s performance to believe how good it is! We’ve exhilarated at Anfield so far this term, scoring four against Leicester and five verses Hull, but the United clash is going to be much tougher. It would be fantastic to rack up another win over a top four rival, especially on a day we’re paying homage to such an important charity.